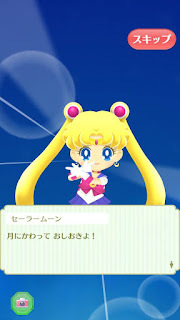 A new Sailor Moon game application was recently released for both iPhone and Android! 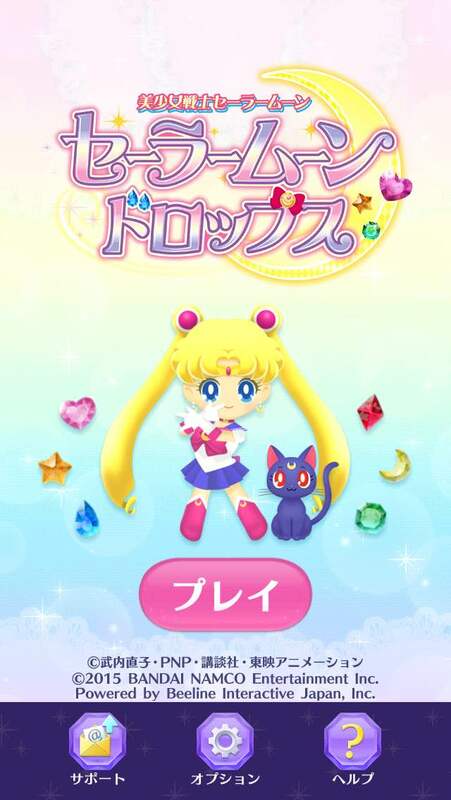 It's a must play for any Sailor Moon fan but unfortunately it's only available in the Japanese stores. 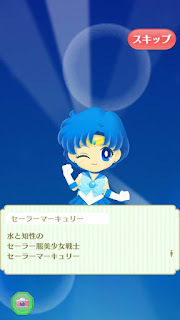 If you are interested in downloading this game, check out this article about how to create a Japanese iTunes account. If you have an Android phone, I'm not sure how that works but I there must be a way you can access it too. Here are the links to download for iPhone and Android. 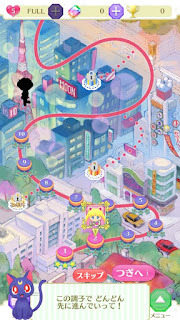 Admittedly, I downloaded this game and wanted to play it a little before reviewing but I got so wrapped up in it that I'm 18 stages in before publishing this post. Below is a brief game guide and my review of the application. Check it out and let me know what you think! 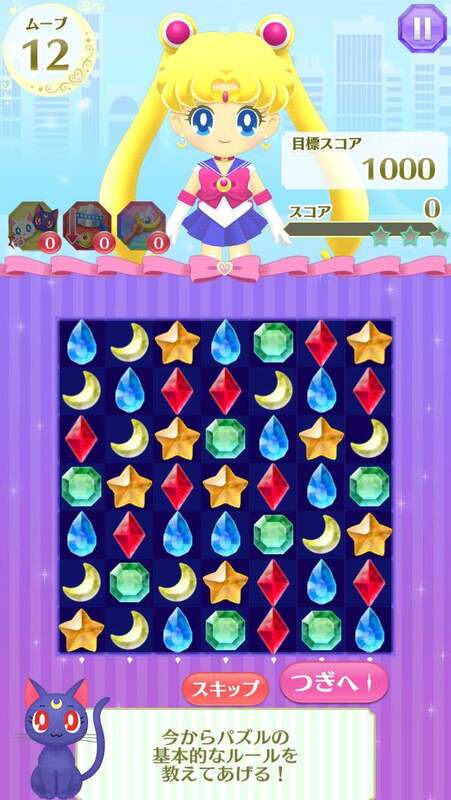 This game style is similar to classic Bejeweled and recently popular Candy Crush. Even if you don't know any Japanese, gameplay is very straightforward. 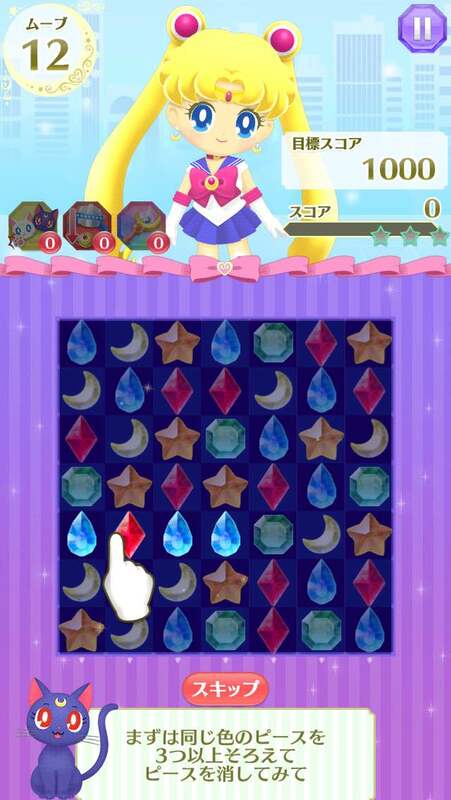 Just match up 3 or more jewels of the same color to complete a move and reach the goal listed at the top right of your screen. 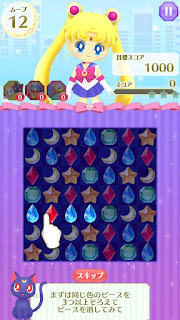 The goals vary from meeting a minimum score, clearing blocks, dropping icons to the bottom of the screen or defeating an enemy. 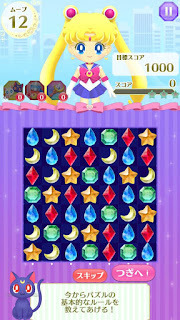 Power-ups are introduced later in the game and you can choose to apply whichever you like to a level. Just follow along where the arrow points for you to click during tutorial portions. It's pretty simple. The story that progresses as part of the game is really cute but understanding it isn't necessary to make the game enjoyable. You can even read parts of the story again in the "collection" section which can be accessed by clicking the furthest right button on the bottom of the map page. One of my friends told me his comics professor in college told him that if a comic is drawn well, you can follow it even if you don't understand the language it's written in. I think the same thing can be applied to games. I give this game a high score for gameplay because it's simple for non-Japanese speakers to play. 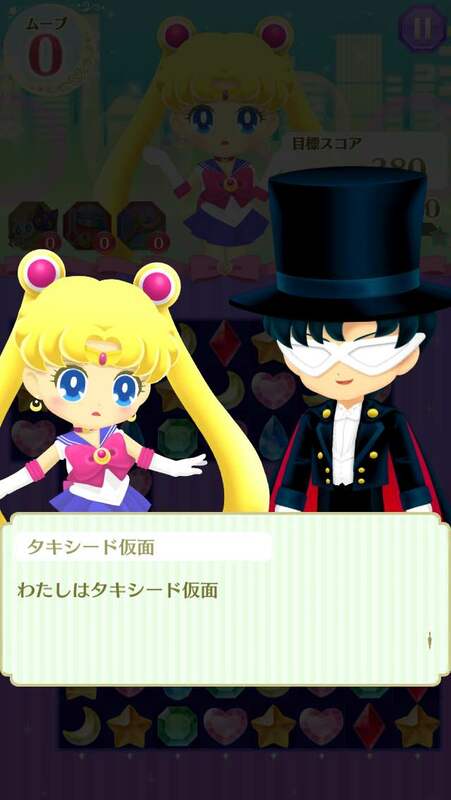 Additionally, all aspects of the game are designed with Sailor Moon in mind; it's very well branded. The new animation style for Sailor Moon Crystal left many fans disappointed but I promise the artwork in this app won't! The graphics and design are perfect! It's not the original character design style, but these updated graphics are adorable and very polished. The style is consistent and really matches the Sailor Moon brand well. I'm very picky about in application design but I can't stop looking at the artwork for this game. 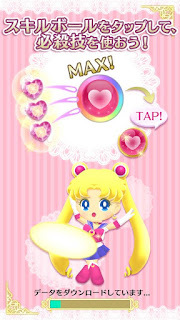 Besides my unwavering love of Sailor Moon, the art was the other main reason that I chose to download this game. The overall experience of playing this game is low-stress and relaxing besides when your senshi of choice looks at you disapprovingly when you're about to fail a level. Playing this game makes me really happy because the graphics are adorable, the music is upbeat and the game itself isn't too difficult to play. I don't really like having to wait to accumulate enough hearts to play more but I understand it's how many applications make a profit. It's okay because the game is still playable even if you choose not to spend money on it. I rated this game a 4 out of 5 because the concept isn't entirely original but I think it was well executed. I highly recommend this game to any Sailor Moon fan!